Muskrats build homes in Neponset ponds and wetlands and in the banks of streams and the river. They live along waterways rich in plant life – on which they feed (they also will feed on small fish, clams, snails and turtles). 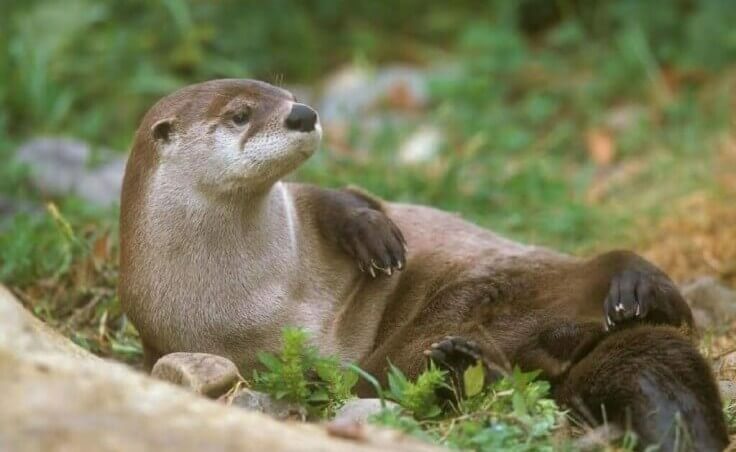 North American river otters build dens in riverbanks and swim through ponds, rivers, lakes, marshes, swamps, and estuaries, feeding on amphibians, fish, turtles, crayfish, crabs, and other invertebrates, aquatic plants, etc. 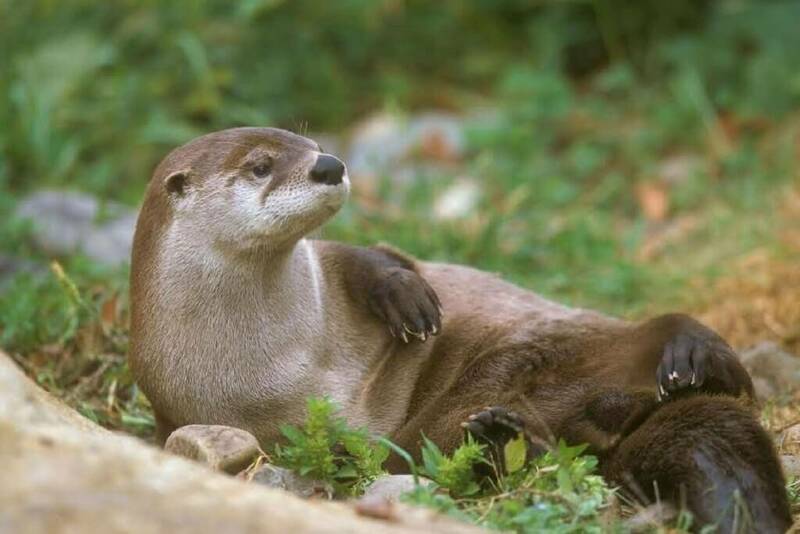 Mammals that use waterbodies to catch food but do not live in them include minks (catch muskrats, fish, snakes, frogs), raccoons (hunt frogs and crayfish, and roll food in the water), and meadow jumping mice (occur in the vegetated borders of streams, ponds, and marshes, although don’t tend to feed on items in the water). Some fish species stay in particular waterbodies year round, while others migrate – for example, between Neponset River and the Atlantic Ocean. Likewise, some fish species use the coldest of streams, while others stick to warmer waters, like ponds. Other fish use the river over streams or ponds, and still others use the salty waters of the estuary or the Harbor. American eels, alewife, blueback, American shad, smelt, and white perch are some of the migratory fish species that travel between the ocean and the Neponset River system. For them, habitat consists of waters used for nurseries, feeding, migrations, and spawning. The Neponset River provides a home for alewife, blueback herring, American shad, white perch, bluegill, American eel, chain pickerel, pumpkinseed, largemouth bass, common carp, fallfish, red breasted sunfish, spottail, white sucker, and smelt (below the Walter Baker Dam in Lower Mills), among a variety of other fish. 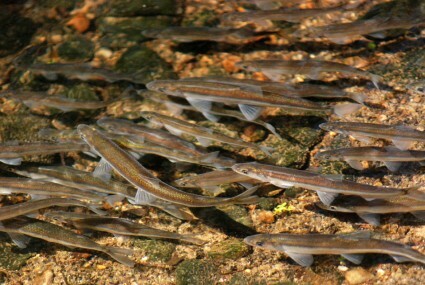 Smelt swim upstream from Neponset Estuary, along a creek in Milton, to spawn. Streams like Mill Brook of Medfield offer habitat for brook trout, darter, redfin pickerel, chain pickerel and largemouth bass. Hawes Brook of Norwood offers habitat for fallfish, American eel, bluegill, largemouth bass, white sucker, pumpkinseeds, and yellow bullhead. Traphole Brook in Sharon provides cold water habitat for brown trout, brook trout, white suckers, redfin pickerel, banded sunfish, and swamp darters. The array of fish in ponds are somewhat different; these fish can tolerate warmer, slower moving water. In Ponkapoag Pond of Canton, look for largemouth bass, chain pickerel, bluegill, pumpkinseed, black crappie, golden shiner and redfin pickerel. In Lake Massapoag of Sharon, add brook trout, brown bullhead, chain pickerel, rainbow trout, and yellow perch to the pond species listed above. The brackish water of the Neponset River Estuary is home to striped bass and bluefish, among many other species. Click here to learn more about migratory fish. 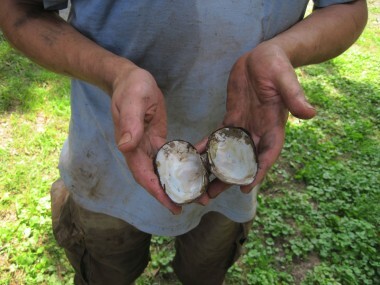 In the Neponset River, look for freshwater mussels, and in the estuary keep an eye out for soft shell clams, blue mussels, barnacles and razor clams, among other shellfish. Crayfish and tiny scuds are a few crustaceans that make their home in the Neponset River and in streams. Neponset Watershed wetlands, ponds and surrounding areas provide habitat for Pickerel frogs, Northern leopard frogs, Green frogs, Bullfrogs, American toads, Spring peepers and Gray tree frogs. In the spring, a visit to a vernal pool can bring sightings of frogs, toads and salamanders who mate at this time of year and leave masses of eggs in the vernal pools, shortly to become tadpoles. Listen to the sounds of spring peepers and wood frogs as they emerge from frozen woodland ponds. Along the edges of the Neponset River, Painted turtles sun themselves on rocks and fallen tree branches. Eastern painted turtles, snapping turtles, spotted turtles, exotic red-eared sliders, and northern water snakes can be found at ponds. Eastern painted turtles eat duckweed, algae, water lilies, and other plants, as well as insects, leeches, snails, crayfish, tadpoles, frogs, fish, and carrion. Snapping turtles feed on aquatic plants, snails, worms, leeches, insects, larvae, fish, carrion, frogs, newts, tadpoles, toads, crayfish, snakes, small turtles, etc. Spotted turtles eat aquatic invertebrates, plants, amphibian eggs and carrion. Red-eared sliders eat snails, tadpoles, crayfish, fish, crustaceans, mollusks, arrowhead, water lilies, and duckweed. Whereas birds may hunt for food in water, they tend to live either in water-side plants or else further from the water’s edge. 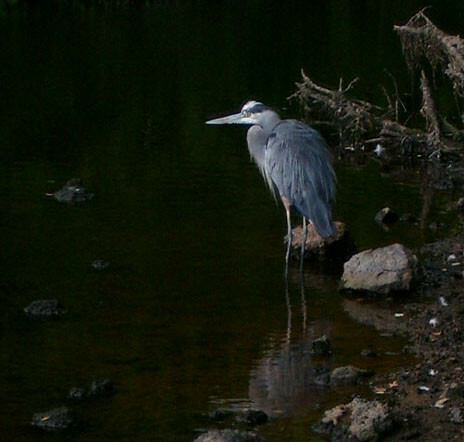 Great blue herons walk through shallow waters, preying on fish, invertebrates, amphibians, and reptiles. Snowy egrets walk the same areas, looking for fish. Great egrets catch fish, invertebrates, amphibians, and reptiles, among other foods. Belted kingfishers and osprey dive into water to catch fish, and also will eat aquatic invertebrates, insects, and small vertebrates. Virginia rails eat insects, insect larvae, other aquatic invertebrates, fish, frogs, and small snakes. Canada geese eat grasses, sedges, skunk cabbage leaves, eelgrass, berries and seeds. Mallard ducks prey on insects, larvae, aquatic invertebrates, seeds and aquatic vegetation. Wood ducks eat seeds, fruits and insects. Bufflehead ducks prey on insects, crustaceans, mollusks and seeds. Hooded mergansers eat fish, aquatic insects, and crustaceans (especially crayfish). Common mergansers prey on small fish, insects, mollusks, crustaceans, worms, frogs, small mammals, birds, and plants. Gulls eat mollusks, crustaceans and insects. 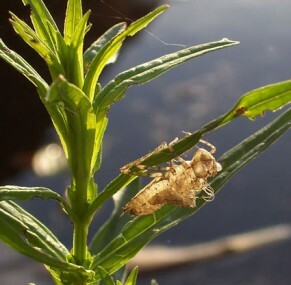 A dragonfly exoskeleton on a Purple loosestrife plant at Ponkapoag Pond. Along the bottoms of Neponset ponds, streams and the river, look for the nymphs and larvae of dragonflies, mayflies, caddisflies, stoneflies, and other insects. Wriggling in the water you may find the larvae of midges and mosquitoes, while predacious diving beetles dive past. Along the water’s surface, find springtails en masse, water striders and water boatmen. You may find plants and algae in ponds, wetlands, along the edges and bottom of streams and rivers, in bogs and wooded wetlands. Some of these plants live entirely underwater, while others are partly submerged. A few of the species you may find fully submerged or floating on the water’s surface in the Neponset Watershed include: seaweeds, floating heart, watershield, duckweed, white water lily, bladderwort, milfoil, and yellow water lily. Growing towards the edges of waterbodies, and sometimes partly submerged, you may find: pickerelweed, cattail, reeds, rushes, sedges, bur-reed, arrow arum, arrowhead, purple loosestrife, blue-flag iris, water-willow, and many more species.